Building a saddle rack with wood is a a cost-effective alternative to purchasing a manufactured rack or welding a metal design together. Wooden saddle racks can be customized to an individual's needs and to accommodate specific types of saddles. They can be accessorized with additional features to help keep a tack room organized. A portable saddle rack can be positioned wherever in the barn it is needed because it is not permanently secured to a wall or the floor. As a result, it can be significantly heavier than a wall-mounted rack because of the additional wood required to construct the base. Wheels can be put on it to make it easier to move. This type of saddle rack often have an upside down v-shaped platform for the saddle that keeps the saddle from tipping sideways off of the rack. For a simple, portable saddle rack, consider using a wooden sawhorse. A wall-mounted saddle rack is handy for permanent tack rooms. Use a 2- to 3-foot-long piece of 2 by 4-inch lumber, screws, eye bolt and a rope hook to keep the cost low. Fancier wall-mount saddle racks can consist of an upside-down v-shaped, plywood-covered frame that is permanently attached to the wall using lag bolts. The saddle rack should be built tall enough, or mounted high enough on the wall, so that no portion of the saddle touches the ground. 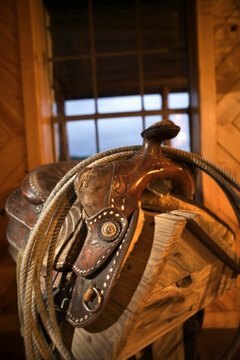 For a western saddle, because the stirrups permanently hang down from the tree, the rack will need to be higher than that for an English saddle on which the stirrups are run up prior to placing it on the rack. To determine the minimum height of the top of the saddle rack, measure from the gullet to the bottom of the stirrups on a western saddle and from the gullet to the bottom of the saddle flap on an English saddle. The wooden saddle rack should be narrow enough that it does not stretch the saddle in any way, but still provides a stable platform to balance the saddle on. For a upside down v-shaped frame, the peak should be narrow enough to easily fit into the saddle's gullet. Measure the narrowest part of the gullet, subtract a half inch, and use this measurement for the saddle rack's peak. To accessorize a saddle rack, consider adding a wood brush box to the underside of the saddle platform. For tack rooms with multiple saddles and riders, it may be useful to add name plates to the outer end of the rack so that the name is visible even with the saddle on the rack. Cover the bare wood with left-over pieces of carpet or rubber matting to help protect the saddle from splinters. Paint the wood to match the barn's interior. Kate Klassen has been a professional writer and photographer since 2005. She has completed work for notable companies such as The Fight Network, Travelodge and The Yellow Pages Group. Klassen attended the University of Calgary and graduated with a Bachelor of General Studies in communications.